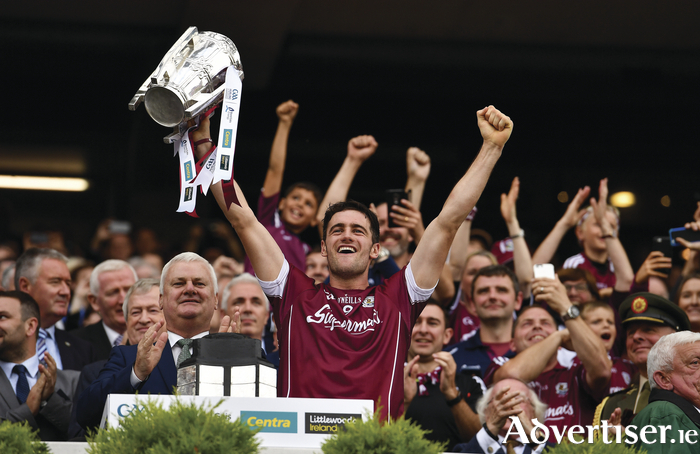 At times it was sparkling, others nerve wracking but at the end of the day it was just brilliant as Galway ended a 29-year wait to bring the Liam McCarthy Cup west of the Shannon for the fifth time. Three minutes in looked like they might do it the easy way, hitting Waterford for three points in the opening 180 seconds, but once Kevin Moran got in behind the Galway defence and drove the ball low past Colm Callanan in the Galway goal to kick life into what looked like a startled Waterford, it was game on. Galway had to dig deep to win this one, they were the better side, but Waterford kept with them right throughout this one and when all was said and done there was just three points between them at the end of the game. The Tribesmen went in leading by just one point at the break, when they would have felt it should have been more, conceding two goals in the opening 35 minutes wasn’t part of the plan, but they stuck to their plan and kept faith in it to the end. Joe Canning got Galway going inside the opening 25 seconds with a brilliant point under pressure running away towards the Cusack Stand, that was followed by the first of four points on the day from their inspirational captain David Burke. The St Thomas’ man emptied himself on the day left everything he had out on the field, before he climbed the steps of the Hogan Stand to follow in the footsteps of Conor Hayes, Joe Connolly and Mick Kenny. Joe Conney put Galway three clear and they were looking even more impressive when Cathal Mannion hit point number four and there was barely three minutes on the clock. Waterford hit back through Moran’s goal, but points from Cooney and Johnny Coen steadied the ship once more to leave Galway in charge by 0-6 to 1-0 after seven minutes. The Munster men though found a groove of their own with Pauric Mahoney and Moran tapping over their first two points of the day, before ten breathless minutes had slipped by. Canning and Conor Cooney raised the white flag inside of a minute of each other to push Galway four clear again as the game moved at a frantic pace from end to end. Michael ‘Brick’ Walsh landed a rousing score for Waterford not long after four minutes later Burke drove over Galway’s tenth point from downtown after being found by Joseph Cooney. Champions are always going to be tested and it’s how you respond to these tests that define you and Galway went point for point with Waterford over the next 15 minutes, before Joe Canning had the final say on the half with a pointed free to send Galway in leading by 0-14 to 2-7 at the short whistle, a deserved lead - but it probably should have been more. Pauric Mahony slotted over two early frees in the second half, with Joe Canning replying with one of his own to leave the game level with 30 minutes to go. Two minutes later Waterford hit the front for the first time in the game through another Mahony free, but Galway showed their champions spirit with Canning responding instantly from a placed ball to bring parity to the contest. Waterford edged themselves back into the lead for a second with a Mahony point from play on 45 minutes, Burke played the captains role hammering one over the bar on the run in the very next play to bring Galway level again. It was anyones game at this stage and it was going to be decided by whoever wanted it more over the next few minutes. Mahony raised the white flag again for his team, but two points inside a minute from Niall Burke put Galway back into a lead they didn’t let slip over the rest of the game. It did get close with Tommy Ryan hammering one over from out under the Cusack Stand to leave the score 0-22 to 2-15 with 12 minutes on the clock, but the trio of points from Canning, Cooney and Flynn were the momentous scores in this game. At the end of four draining minutes of injury time, the Galway faithful were able to erupt and celebrate a win that has been almost three decades in the making, putting he hurt of their six previous final defeats since the last lifted the Liam McCarthy to bed and head home to the west as All Ireland champions. Galway: Joe Canning 0-9 (6f, 1 sideline ), David Burke 0-4, Conor Cooney 0-3, Cathal Mannion 0-2, Joseph Cooney 0-2, Niall Burke 0-2, Jason Flynn 0-2, Conor Whelan 0-1, Johnny Coen 0-1. Waterford: Pauric Mahony 0-11 (8f ), Kevin Moran 1-1, Philip Mahony 1-0, Jamie Barron 0-2, Michael Walsh 0-1, Brian O’Halloran 0-1, Tommy Ryan 0-1. Galway: Colm Callanan; Adrian Tuohey, Daithi Burke, John Hanbury; Padraic Mannion, Gearoid McInerney, Aidan Harte; Johnny Coen, David Burke; Joseph Cooney, Joe Canning, Jonathan Glynn; Conor Whelan, Conor Cooney, Cathal Mannion. Subs: Niall Burke for Jonathan Glynn (43 ), Jason Flynn for Cathal Mannion (55 ), Shane Maloney for David Burke (68 ). Waterford: Stephen O’Keeffe; Shane Fives, Barry Coughlan, Noel Connors; Kieran Bennett, Tadhg de Búrca, Philip Mahony; Jamie Barron, Kevin Moran; Darragh Fives, Austin Gleeson, Pauric Mahony; Shane Bennett, Michael Walsh, Jake Dillon. Subs: Maurice Shanahan for Shane Bennett (22 ), Brian O’Halloran for Jake Dillon (48 ), Tommy Ryan for Michael Walsh (56 ), Colin Dunford for Jamie Barron (64 ), Patrick Curran for Kieran Bennett (64 ).